Home> Resource> iOS Transfer> How to Transfer iPod Photos to Mac OS X? Theoretically, iTunes can backup all your iPod contents well and keep them safe forever on your personal computer. But under some situations, your computer may crashed or formatted so that you lost the whole iTunes library by accident, then you need to back the iPod photos to iTunes library on Mac; Or while having a collection on your iPod, you may wish to load the photos to the Mac computer for releasing space or further editing or sharing; Or you may have the need of transferring iPod pictures to Mac due to various reasons. 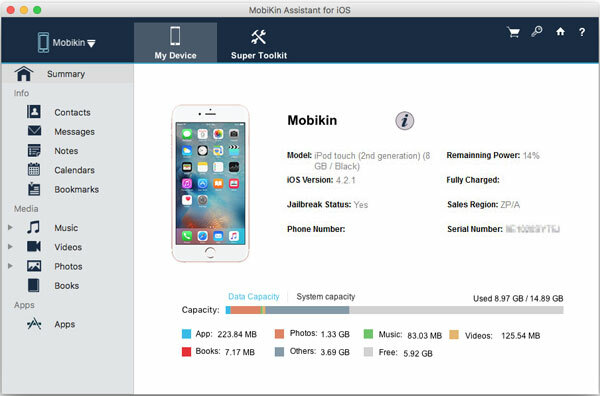 Thus, more and more situations result in exporting photos from iPod touch, iPod nano or iPod classic to Mac in the daily life, but how to do it here? iPhoto is a built-in application, that is specially designed for Mac users to manage their digital photos on the Mac OS X. 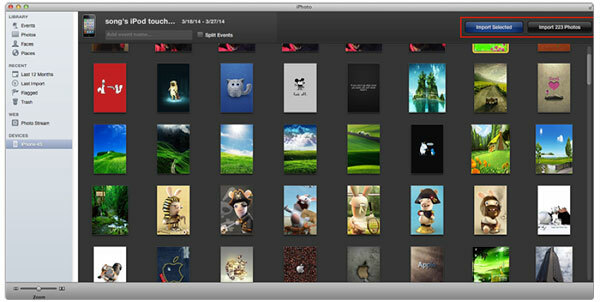 So with the help of iPhoto, you can share pictures from iPod touch, nano or classic to desktop Mac easily. Step 1. Connect your iPod touch or other device to the Mac computer via its USB cable. The the iPhoto will be launched automatically. If it is not started, you can open and manually start it. However, sometimes the iPhotos may fail to launched and you may need to change the default setting to fix the problem. But the process may be a little bit troublesome and complex if you have no technical skill about Mac OS X system. Thus, we could like to strongly recommend you to take the second solution into your consideration. 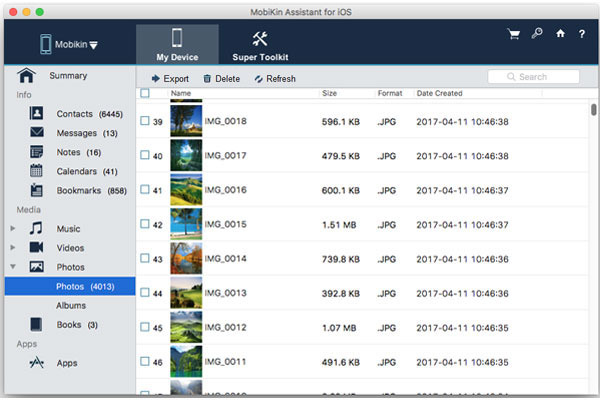 MobiKin iPod Photo to Mac Transfer is specially designed for Mac OS X users to export and save iPod photos on Mac computer. And it also have the ability to transfer other data like movies, music, books, voice memos, etc. to Mac from your iPod touch, iPod nano, or iPod classic without hassle. Now, just click the below icon to have a free trial on this powerful program. If you wish to get more details about the Windows version, you can click here. Step 2. Hit "Photos" option in the left panel to preview the detailed image info before exporting. Then mark the pictures you want to backup on the Mac computer, and then click "Export" button to save them on your Mac computer. Obviously, iPod Photos Transfer for Mac could be the best solution to copy photos from iPod touch to Mac computer. If you have the demand at present, then please don't hesitate to get the program right now!